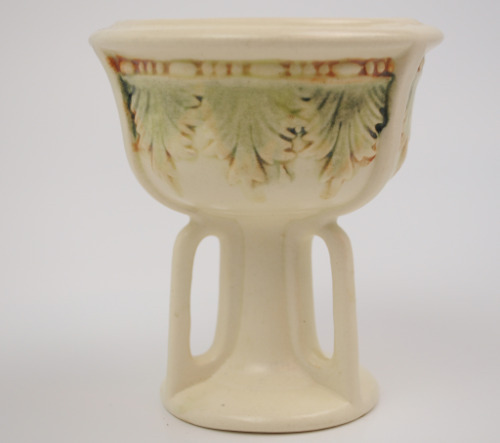 This is the Weller Pottery Roma Pedestal Compote in very fine smooth glaze touch condition. Manufactured between 1914 and 1920, it is in remarkable condition for it's age. There are no chips, cracks, hairlines, or repairs on the piece anywhere. The hallmark of Weller is very prominent (see photos) and is die impressed. The nice intricate yet smooth details, swag under rim design, and natural fades of manufacturing make this a real stand out for your collection or decor. Just a pristine example of the finest in Weller Art Pottery. IMPORTANT FREE SHIPPING NOTE: This Weller piece will ship very carefully padded, double boxed and packed via USPS Priority Mail for safe and faster delivery absolutely free to your doorstep!